Prior to 2007, players that suffered concussions may have been allowed to return to action in the very same game in which the incident occurred. In 2007, the NFL adopted it’s first set of guidelines on return-to-play criteria based on a medical conference held specifically to discuss concussions. These new guidelines would not allow players to return to a game or practice in which he lost consciousness and that a player must be completely asymptomatic and pass his neurological tests normally before returning to play. In addition, the NFL agreed to expand neurological testing for all players, particularly those who had suffered a concussion before. If a player suffered a concussion in the season, he would be required to undergo extra neuropsychological tests later in the year. In August 2009, NFL executives and lawmakers joined at the House Judiciary Committee to discuss the effects of head injuries in the sport, at which they were criticized for not taking more action against concussions. A new, stricter set of guidelines followed that year, which said that a player could not return to a practice or game if he shows ANY of the symptoms of a concussion, not just a loss of consciousness. 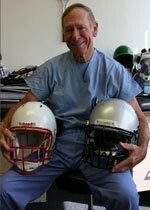 A player also now must be analyzed by an independent neurologist as well as his team physician after a concussion. In the 2010 season, the NFL began to crack down on helmet-to-helmet hits in an attempt to reduce the amount of concussions suffered by players. The league issued large fines to players, particularly repeat offenders, and said suspensions would be considered for those who continued to commit illegal hits. Following an incident where Browns QB Colt McCoy was allowed back in the game after suffering a concussion, the NFL instituted a policy that an independent trainer would observe the games and alert team training staffs to possible head injuries. The Browns had previously said that their training staff had been occupied with other injuries, and hadn’t been aware that McCoy suffered a hit to the head. The NFL policies relating to concussions are advised by the NFL’s Head, Neck, & Spine Committee. Professional Football Chiropractic is excited to have the opportunity to feature Dr. Robert Cantu, Senior Advisor to the NFL’s Head, Neck, & Spine Committee, at the 6th Annual PFC chiropractic continuing education seminar held in Indianapolis on February 25-26th this year (2012). Dr. Cantu will be covering Concussion Management: Short and Long Term Consequences of Mismanaging A Concussion – Catastrophic and Long Term Outcomes After Traumatic Brain Injury. While the chiropractors working with NFL and college level teams often have a full complement of medical professionals at each event, most chiropractors involved with lower level sports teams may be the only medical professional at an event. With concussions becoming such as major issue in sports at all levels, this is one lecture you cannot afford to miss as a sports chiropractor. For those of you working with teams that have coaches who want to learn more about concussions, the CDC and USA Football have teamed up to create an informational PDF file on concussions. More information on concussions can be found at the Center For Disease Control’s concussion page including a quick link to concussion information for the physician and USA Football’s page on Concussion Awareness and Safety which includes videos and links relating to concussions. Speaking Thursday, Giants GM Dave Gettleman declined comment when asked if he was interested in Cardinals QB Josh Rosen.